If you suffer from a lot of headaches, like I do, you know that a pain-free day can feel like a gift. I’ve tried a lot of remedies and modalities to help lessen the frequency and severity of my headaches. Peppermint and lavender essential oils help—sometimes. Magnesium—sometimes. Meditation—sometimes. Eating well—sometimes. Many people, upon hearing that I suffer from headaches, which run the gamut from dull, constant ache to full-on debilitating migraine, nod sagely and suggest I try some yoga, a suggestion that I always used to find humorous—after all, I am a yoga teacher! But truthfully, although I have a fairly well-developed yoga practice, it wasn’t until recently that I considered practicing asana specifically as an antidote to headaches. 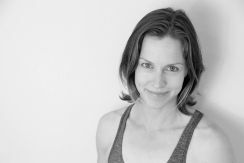 To be honest, I often simply focus on the type of yoga I feel like doing—for example, flows that prep me for playful and fun inversions or arm balances—rather than on what might ease my headaches. But as a Yin Yoga teacher, I knew I had tools that might be useful in alleviating these “issues in the tissues.” It was time to tap into my knowledge and devise a “Yin Yoga for headaches” practice. Yin Yoga is influenced by Traditional Chinese Medicine (TCM), which holds that headaches can be caused by blockages of chi (energy) along both the gallbladder and the urinary bladder meridians. (In TCM and in Yin Yoga, meridian refers to an energy pathway within the body.) If you go to an acupuncturist to treat your headaches, these meridians would be considered. 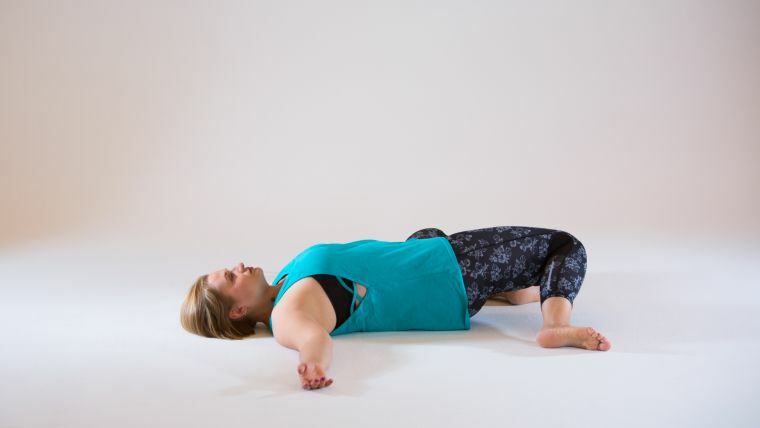 Yin Yoga poses aim to tug or gently apply pressure to the connective tissue that a particular meridian runs through. The sequence below stretches or applies pressure to the parts of the gallbladder and urinary bladder meridians that can be affected by Yin (the sections of the gallbladder meridian that run down the side of the ribs, hips, outer legs, and tops of the feet, and the parts of the urinary bladder meridian that run along either side of the spine and down the buttocks, legs, and outer ankles and feet). It also includes some upper body poses intended to relieve tension in the neck and shoulders. This sequence clocks in at an hour, but can be adjusted according to your needs. This might mean holding a pose for less time than suggested or adding props. Listen to your body, and if a pose causes pain or doesn’t feel right for you, come out, try the counterpose, and move on to the next one. 1. To begin, take five minutes to scan your body, noticing without judgment what’s going on with it today. Where are the areas of “yum”? Of “yuck”? What did you bring to the mat with you? Did you sleep well last night? Have you eaten? Do you feel sore, tight, or stuck anywhere? Are there places that feel energetic, relaxed, or happy? Mentally catalog this data to understand how your body’s current state might affect your practice today. You might then try directing your breath and awareness toward areas of pain or discomfort and celebrating the ease in other areas. 2. Shoelace pose targets the gallbladder meridian. To move into the pose, start seated in a cross-legged position (such as sukhasana, or “easy pose”) with your right shin in front. Then, move your left foot to the outside of your right hip and stack the knees as much as possible. Gradually move your feet away from your hips, if comfortable, perhaps even bringing your shins parallel to the top edge of the mat. For less intensity, you can extend your bottom leg and sit on a folded blanket, block, or the edge of a bolster. Gently allow your right ear to drop toward your right shoulder to add lateral flexion of the neck. Stay for one to two minutes. Then bring your head back to center and stretch the back of your neck by interlacing your hands behind your head and drawing your elbows toward each other. Let the weight of your arms provide traction for your cervical spine as you allow your head to drop. Stay for one to two minutes. Gently bring your head back to center and repeat both stretches, this time gently dropping your left ear toward your left shoulder (your right leg remains on top). For a counterpose, come into deer. Take your bent right leg behind you. Let your left leg remain bent and externally rotated where it is, with a 90-degree bend in the knee. Twist to the left and hold for two minutes, looking over your shoulder. 3. Switch the crossing of your legs and repeat shoelace on the other side. This time, take eagle arms for one to two minutes with the left arm on top and one to two minutes with the right arm on top. Then release your arms, fold forward, and rest your elbows on blocks, which can be at any height depending on the depth of your forward fold. From here, take Kali mudra (interlace all fingers save for the index fingers), directing your index fingers to the sky. 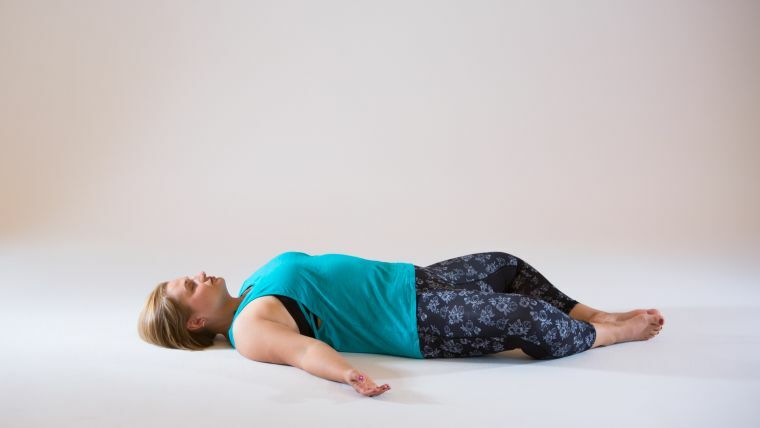 Allow your chest and head to drop between your arms and soften. Stay for one to two minutes. Take deer on the other side for two minutes. 4. Straddle pose with a fold works the urinary bladder meridian, and twisting to each side targets the gallbladder meridian. To move into straddle, start seated and open your legs as far as they will go, sitting up on a blanket if necessary to achieve an anterior (forward) pelvic tilt. Fold forward and hold for three minutes. Then take your favorite variation of revolved janu sirsasana. Hold for three minutes, and then repeat on the other side for three minutes. Come onto your back, bend your knees, and place the soles of your feet on the floor, mat-width apart. Let your knees slowly drop from side to side like windshield wipers for one minute as a counterpose. 5. Reclined butterfly is a favorite pose of many of my Yin students. Lying on your back, bring the soles of the feet together, knees bent and out to the side in reclined baddha konasana (bound angle pose), but move your feet about one to one-and-a-half feet away from your pelvis to form a diamond shape with your legs. You can place a bolster horizontally under the upper thighs and/or a lengthwise bolster under the spine for a more supported pose if you like. If you are feeling a stretch but no pain, known as your “edge,” in your outer thighs, it’s an indication that the gallbladder meridian is being targeted. If the sensation is experienced in the inner thighs, the urinary bladder meridian is in play. Both or either is desirable! Stay here for five minutes (or up to 15 if you’d prefer). 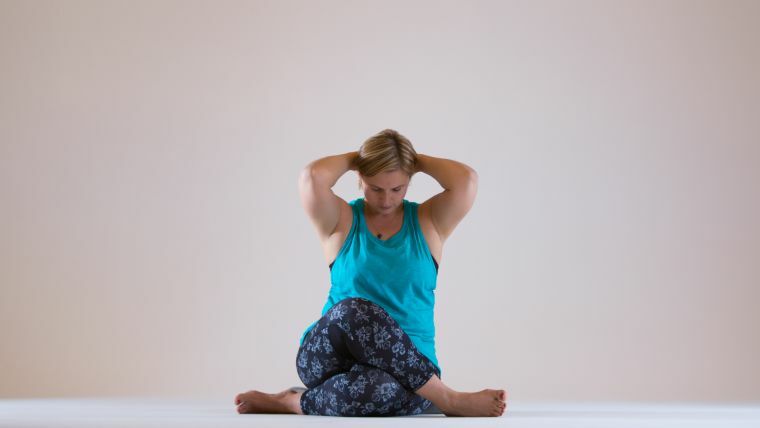 Bring your knees together and draw them into your chest for one minute as counterpose. 6. Caterpillar targets the urinary bladder meridian. This pose is a seated forward fold with the legs extended and the spine rounded. The head can drop or be lifted slightly. Remain in caterpillar for five minutes or, if you'd rather, stay in caterpillar for two minutes and move into snail pose for three. Snail pose is plow pose (legs straight or bent) with a rounded spine. For more added support, you might try bringing the soles of the feet against a wall. If snail is not available, remain in caterpillar. It’s best to avoid snail if you have neck issues. As a counterpose, take hammock, resting back on your forearms with knees bent and feet on the mat (hips can remain on the floor or be lifted). Move in any direction that feels good for one minute. 7. Come onto all fours, keep your hips stacked over your knees, and walk your hands out as far as your shoulders allow, letting your heart drop toward the mat in anahatasana (heart melting pose), which will also affect the urinary bladder meridian. Resting your forehead on a block may further activate the parasympathetic nervous system (the rest-and-digest system), which is appropriate at this point of the practice. Linger for three minutes. From here, walk your hands back, and make your way onto your side and then onto your back. Gently extend your legs straight up to the sky for a relaxed legs-in-the-air pose with soft ankles and knees. Enjoy this nice, soothing counterpose for one minute. 8. The final pose is a one-knee-bent reclining twist. From legs-in-the-air pose, bend your knees and hug them into your chest. Keep your right knee bent and extend your left leg along the mat. Draw your right knee across your body to the floor on your left side and allow your torso, especially your right shoulder, to twist to the left so your right knee drapes over your left thigh. Slide your right arm up along the floor, bringing it to rest directly overhead (alongside your ear) or out at a slight angle. You can gaze in whatever direction serves you: Looking toward your overhead arm may provide more stretch for your neck; looking toward your right knee may increase the sensation in the middle of the right shoulder. Hold for four minutes, and then repeat on the other side. Twisting at the lumbar spine (lower back) affects the urinary bladder meridian, while twisting higher up, through the thoracic spine (rib cage), affects the gallbladder meridian—either is fine, and so is twisting with the knees bent at 90 degrees or lower for two minutes followed by two minutes with the knees higher. As a counterpose, hug your knees into your chest for one minute. 9. Come into savasana for five minutes to help get rid of tension in the head, which might help to further soothe or prevent headaches. 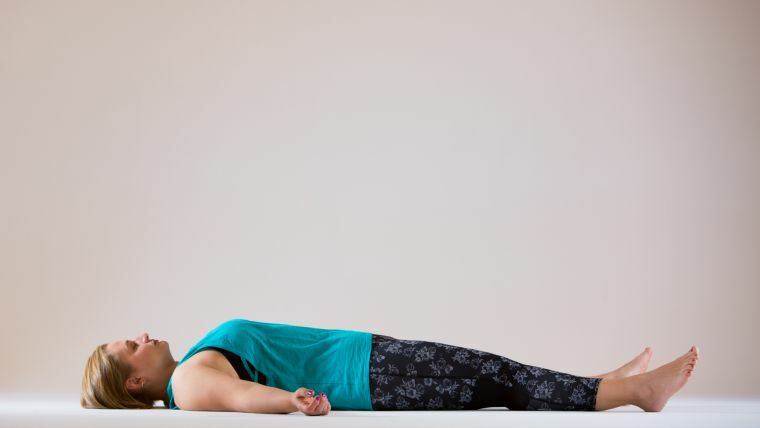 In your savasana, focus on how your tongue feels, relaxed and heavy, on softening the back of your eyes, letting your jaw go slack, and releasing any tension in your forehead, the sides of your head, your neck, and shoulders. I hope you enjoy the sequence and wake up each day with your head calm and pain-free.